I'm really enjoying this book! 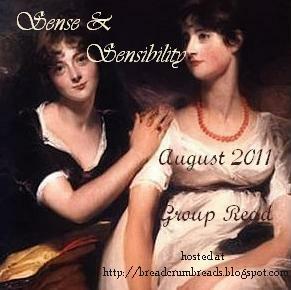 With the classics, I sometimes feel as if the pace is too slow and the details are hard to follow, but I'm not finding this to be the case with Sense and Sensibility. I'm not sure that this has something to do with the way Jane Austen writes or that my reading ability has evolved, but I'm so happy I'm finding it this way – now I can really appreciate the story! First there are our two heroines of the story – Elinor and Marianne Dashwood – two sisters with very different personalities. Elinor is sensible and calculated, while Marianne is the exact opposite. Marianne reminds me of a modern teenager – she's opinionated, dramatic and a little high strung! I wonder if as she gets older, she'll be exactly the same as her mother, Mrs Dashwood? They already seem very similar in their excitable ways, and Elinor is always having to keep her in check much in the way that she must with Marianne. Mrs Dashwood is lovely, though. Very kind hearted and always has the best of intentions, even if she does get a bit carried away at times. It's a shame that back in the 18th century, everything had to be inherited by a male heir as I'm sure these sisters and their mother deserved to stay at Norland far more than Mr John Dashwood and his selfish wife did. But he was so easily manipulated by his wife that it couldn't be possible. Thank goodness that Sir John Middleton and Lady Middleton offered them the cottage on their Devonshire estate just at the right time! I think out of the two sisters, I prefer Elinor as she seems to be more fair in her judgements towards situations and also other people. Not that I have anything against Marianne – I love her fun personality, but I dislike the way she judges those who aren't as animated as she is (namely Edward Ferrars and Colonel Brandon). Also I really didn't like her behaviour with Willoughby. Though I'm glad he makes her happy, they seem to be really overindulgent and immature when put together. Plus it seems a little too coincidental that they have so much in common. But I was very sad when he went away, and really felt for Marianne. I wonder if the business that sent Willoughby away so quickly is the same that sent Colonel Brandon away? Maybe they have a connection in London, and this could have some reasoning behind why Willoughby disapproves of him so much? Only time will tell, but I'm really interested to find out what's going on there. It really upset me when Lucy Steele revealed to Elinor that she had been engaged to Edward for quite a while, and particularly the way she went about doing this. I don't much like the Steele sisters – they just seem a little too vulgar (as Jane Austen would put it), and have no sense of social limitations. This will sound mean, but I truly hope that their engagement breaks up so Elinor can marry Edward instead. If this can't happen, then Colonel Brandon also seems a good match for her. But I'd really prefer Edward. As for the more comical characters, well, I can't help but love them. Mrs Jennings really does make me laugh – she's so ridiculous and out there! No Austen novel would be complete without such a person as this to lighten up the mood every now and again. The same goes for the completely naïve and unassuming Mrs Palmers, who just doesn't understand her husband at all. It's a good job too because I bet she'd be a very miserable woman if she did! I'm hoping to see more of them in the story. Phew! There you have it. So much to sum up in this volume! What do you think? What are your opinions of the events thus far?